What is the CHISQ.DIST.RT Function? 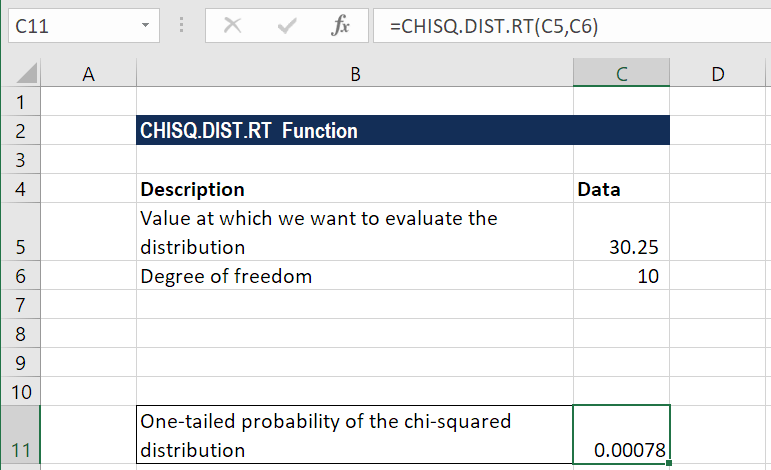 The CHISQ.DIST.RT Function is categorized under Statistical functionsFunctionsList of the most important Excel functions for financial analysts. This cheat sheet covers 100s of functions that are critical to know as an Excel analyst. It will calculate the right-tailed probability of a chi-square distribution. We use this function to compare observed and expected values. So, the χ2 distribution is associated with an χ2 test. In financial analysisFinancial Analyst Job DescriptionSee a real Financial Analyst Job Description including all the skills, experience, and education required to be the successful candidate for the job. Perform financial forecasting, reporting, and operational metrics tracking, analyze financial data, create financial models, the function can be to find out and compare observed and expected values. For example, we can find out a link between our revenues and the geographical location of our customers. If we get a small value from the chi-square table, it means that there is not much of a relationship between the two given variables. However, if we get a larger value, it indicates a greater relationship between the two variables. X (required argument) – It is the value at which the chi-square distribution is to be evaluated. It should be greater than or equal to zero. Deg_freedom (required argument) – It is the number of degrees of freedom. It must be an integer between 1 and 1010. 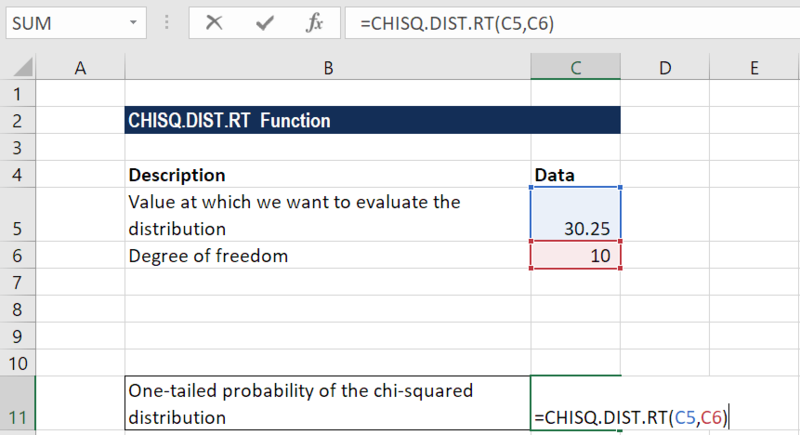 How to use the CHISQ.DIST.RT Function in Excel? 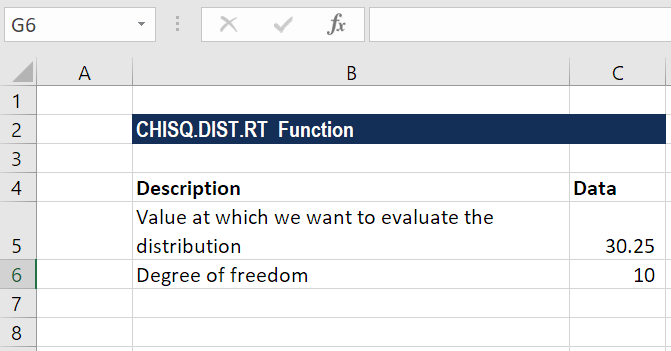 If the deg_freedom argument is not an integer, it is truncated by MS Excel. The function belongs to the CHISQ group of functions. It was introduced in MS Excel 2010 and hence is unavailable for earlier versions. The CHISQ.DIST.RT function is an updated version of the CHIDIST function. #VALUE! error – Occurs when any of the arguments provided is non-numeric. Remember, CHISQ.DIST.RT will accept only numeric datasets for both arguments and return numeric data. The given value of x is negative. The deg_freedom argument is less than 1 or greater than 1010. CFI is the official global provider of the FMVA Financial Analyst Certification, designed to transform anyone into a world-class financial analyst.